I vowed to avoid any slanderous comments about bad hair days, my five foot two stature, or my weight. When my psoriasis, which normally is kept under control with medicine, flared after each pregnancy, as was apt to happen in the most unfortunate, hormone-laden timing, I never uttered that I felt ugly, although I felt it acutely. When I eat well, which I certainly try to do, I explain how it makes me strong and healthy. When I eat poorly, which I also certainly do on occasion, I don't verbally beat myself up for it. When the girls watch me exercise in the morning (or, in Kerrington's case, climb on me while I'm stretched in a plank pose doing Jillian Michael's walking push-ups), I never discuss getting skinnier. I do, however, tell them that their mama's getting strong. Currently, there is one woman to whom my daughters look when they perceive how a woman should feel about appearance, beauty, weight, and the intricate link with self-worth. That woman is me. I refuse to let them down. Whether we've been given the privilege and responsibility of raising daughters or sons, how we talk about ourselves and our appearance shapes how our children view womanhood -- whether they think it's normal or permissible to eat only salads, lament cellulite, or lust after the media's unattainable standard of perfection. I don't want this for my daughters. Do I want them to eat well, remain fit, and stay trim? Absolutely. Who wouldn't want this for their children? But more importantly, I want my daughters to be assured that their value never ought to be based on appearance. I don't want them to succumb to the wearisome trap of always striving, but never feeling as if they're enough. Plenty of beautiful women don't feel as if they're beautiful. Contentment is an attitude of the heart, not contingent solely on externals. That's why I liked this article about how to talk to little girls. Do I tell my girls that they're beautiful? Absolutely. But we stress other attributes more highly. Besides, the benefits of this practice don't end with my daughters. When I made a conscious choice to ban negative self-talk, it forced me to confront my own insecurities and re-evaluate my worth. Fearfully and wonderfully made, we are, and that's the standard to which I'll hold firm. I'm not perfect in this. There are days when I'm utterly confounded by the fact that I'm applying both anti-aging lotion and acne cream (really now! ), but at age thirty-three after having three babies within five years, I'm more secure about myself than I've ever been before. And, I'll tell you something, that's attractive. Humor, hope, and encouragement for moms: Then I Became a Mother. Available in Kindle and paperback editions! "I got so caught up in it, I couldn’t put it down." Stacy Nelson, Motherhood on a Dime. "Hilarious and spot-on!" Jennifer Mullen, Mosaic of Moms. I love this post! It is so true! 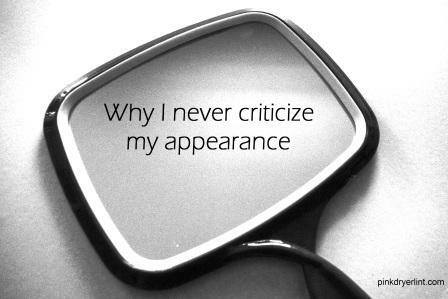 There is so much negativity out there in the world when it comes to appearance and self-worth. It is definitely up to us, as mothers, to teach them what really self worth is all about. Having had psoriasis myself, I definitely have a scarred self-image. Now with 3 daughters of my own, I constantly struggle with this as well - not wanting to impart my insecurities to them. Thanks for sharing - you have a wonderful attitude about it and have made a very admirable commitment! Well written my dearest Robin! How God has truely made you an inspiration for us insecure ladies! This is EXACTLY how I want to impact my daughters/sisters of the lord. This is a truly lovely post. Amen. Bravo! I agree wholeheartedly. We praise Dudette for her humor, insight, compassion and politeness, showing her that inner beauty is so much more important than outer (especially since so many people comment on her outer beauty). I have to admit though, I thought you were going to say that you never criticize your appearance in front of them because any comment you make will be repeated in public (not that I know that from firsthand experience or anything ::sigh::). Good job on this post. Too much empahsis is on outward appearance. Work on the inside and it will shine through. I completely agree! I made that pledge before as soon as my daughter was born. Our children watch and hear everything we say and do. They make connections about their world and their place in it based on much of what they observe and process through their parents. Thank you for sharing such a beautiful posting. This is a beautiful post. I commend you for teaching that being attractive is an inside job. If you feel gorgeous, you will be gorgeous. It is so important to convey that self-love is a choice. Even having boys, I think they benefit from a mom with a real body viewing herself as looking "just fine, thank you." This is a great post. I have a question: have you ever asked family to not call your daughters cute or pretty the first time they see them, or excessively? My mother-in-law especially calls my boys cute and too cute VERY often when she sees them, which is quite a bit since we live close. I'm not sure if I should ask her to try to tone it down or not...just wondering if anyone has had that experience. Thanks so much for the comments, everyone. Dawn, no, I've never requested that people don't compliment my girls or tell them they're cute. Honestly, I don't think this type of praise will hurt kids. Plus, it's like giving/receiving gifts -- let the giver (the compliment giver, that is) choose how to lavish love, even if you would do so in a slightly different fashion. I think the key is balance. As long as we don't harp solely on looks, I think our children will learn that there are many other attributes more important than external beauty. Robin, thank you for visiting my place and letting me know about your post. I have made the same pledge. I have vowed to fight in her life the influence of a society that tries to tell her what is beautiful and what is not. It's an uphill battle but one worth fighting and it starts with me. Thank you so much for linking to this on my blog. I love it so much and it is very convicting to me. This continues to be a HUGE struggle for me....I can't ever seem to keep my weight where I feel my best, and it bothers me greatly. BUT, I know I am beautiful to my kids and my husband, and by me tearing myself to shreds, that causes confusion, pain, and more distorted thinking for them, so I praise myself in spite of myself. Thank you for sharing this post. Love this post. Really, as a mother of a 7-year-old girl I need to be more diligent about what comes out of my mouth. This is great inspiration to do just that. Such an important message for all moms. Thank you for posting it. Totally with you 100%. My weak point has been talking too much about clothes or showing concern about 'what to wear' which I now regret. There's a brilliant book called Where Has My Little Girl Gone? by Tanith Carey which looks at all these issues and offers really practical advice on how to fight against the inevitable tide of peer pressure to look perfect etc. Her basic tenet is that we urgently need to be working on our girls' self esteem in the tween years (8-12) which she explains so well. Go check it out on Amazon. Sounds like a great book. Thanks for the recommendation, Siobhan! My youngest daughter always says that cuteness is her super power... it is always followed with the most adorable "because SWEET is always cute!" BTW... tears to my eyes, this totally went right to the heart of what i have always tried to teach my children... amazingly well put. Your daughter is wise. Sweet IS cute!